The release of 'The Shop Around the Corner' saw the American audience captivated by the on-screen love affair of James Stewart and Margaret Sullavan. Set in Budapest, Hungary, the film presented two protagonists who shared hostility in their working environment- a bookshop- but maintained a romantic liaison through mails without knowing their true identity. In 1998, the timeless film saw a comeback in the form of “You've Got Mail,” the box office sensation that featured Tom hanks and Meg Ryan. The decade saw the emergence of the Internet, online chat rooms and quick flying emails. But what the film truly cashed in on was sweet romance and the nostalgia of the mail. Art and literature always cherished the lure of the post. Its role in our lives was quite significant in the not too distant past. It brought us closer. Yes, the telephone was there, and the telegraph before that, but mail was a reflection of emotion in tangible script and paper. It bridged distances, its realm spread continents and its form was universal. Yaqub Jamil cherished the letters his father wrote from Calcutta back in 1946. The time was turbulent as the winds of change blew across the continent. To his unborn child, Taher, Jamil's father wrote regularly not only of politics and the dark facets of human behaviour but also words of hope, love and the beauty of life. His last letter was written on the eve of the great Calcutta riot; the day he last saw the city he grew up in. Reading the letter, a chronicle of the days of history, Jamil finds a different view of his father. He finds a different picture of a person, which evaded him through all the years that he knew his father. Yes, the post has been our dear friend in perilous times and in times of anguish. Yet, it also befriended us in times of peace, and love. The blue envelope is any girl's dream, as is the affection from prince charming. Saving mails of love lost and gained, is special even to the most apathetic soul. “My letters were for me to burn, or for me to cherish. I can never forgive my mother for what she did. He was such a hopeless romantic; never wrote letters, but carefully picked poems that suited his thoughts or what he had to say. We couldn't risk the chance of getting caught so the mails were never posted. My cousin, Shubhro was our postman. We even tipped him. I guess my mother knew better and probably tipped him more for disclosing my affair”, said Jamie in sunken nostalgia. The postman was like a friend in the days gone by. So was the neighbourhood hawker who delivered the newspaper. It is probably because of what they did; both involved in conveying news. Shujan Ettelet thought of the postman as his only true friend. Whether it was because of this feeling, which was genuine, or the bokshish that brought all his mails regularly was a fact that still evades him. But he hugged Haripodo, the postman the day he delivered his I-20! Children are taught to write letters in school, but in their real life the only connection they have with writing mails is through the Internet. Unless they are taught the importance the post have had in our lives. Meet Syed Ahsan Habib, architect by profession, philatelist by passion. His love affair with stamps began in early childhood and Habib still remembers rushing to the nearby stamp shop at Hawker's Market (Stamp Corner it was called) during school break. Browsing through the stock books of the small, stamp shop he spent endless hours, but his metamorphosis from beginner to a seasoned philatelist has been a journey spanning over three decades. “I enjoy the philatelic circle. The people that I have befriended over the decades range from seventy to teenagers in the stamp shop who have come to make their first purchase of stamps. “Stamp collection was a widespread hobby amongst school goers in the seventies and for the better part of eighties. Every corner bookshop showcased stamps from exotic locales- Guinea Bissau, Ajman and Magyar Posta (Hungary). I don't see that happening these days. “Children are more interested in other pursuits and parents also fail to understand that stamp collecting as a hobby must be nurtured from home. The government is also silent in promoting philately. During the days of communism, stamps were chosen as a tool for propaganda for the Red Revolution by all communist nations. That is one of the reasons why we used to find cheap stamps from countries of East Europe” says Habib, sunk in nostalgia. To the novice, young and old, stamps are just pieces of coloured paper. But every stamp has a silent story ready to be unveiled by the collector. This is possibly the best aspect of philately- it is adaptable. No matter what subject interests the collector, chances are that the taste of the individual can be reflected through his/her collection. “I have always been fascinated by Mahatma Gandhi and his ideology of passive movement. My meagre collection on Gandhi is nothing but a reflection of that love. These days when we are being plagued by corrupt politicians devoid of ethics and morality, teaching of leaders like Gandhi are essential” said Syed Ahsan Habib. The same is true for his collection on Sheikh Mujibar Rahman, which arguably is the best philatelic collection on Bangabundhu ever assembled. Not only does it contain bona fide philatelic materials like stamps, post cards and stationery but also his formidable collection of mail addressed to the great leader, which turns all philatelists green with envy. The jewel of the crown is no doubt the rare autographed cover of Sheikh Mujibar Rahman, amongst others, on the day the Constitution of Bangladesh was passed in the parliament. To sink deep into the subject of stamps one needs maturity and financial strength. Although it is possible to have a collection on a small budget, but it does require some form of investment. Unless grown ups patronise the hobby it is not possible for the young to pass through the stages that would allow them to understand stamps better. 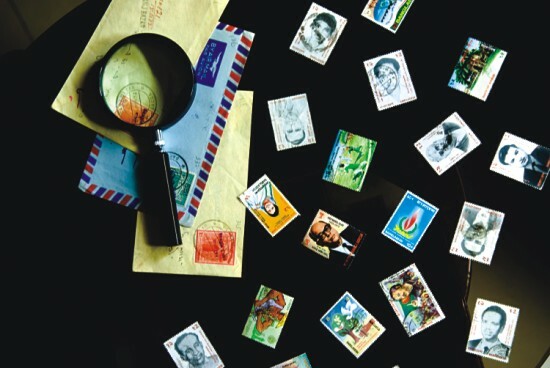 It is not important for every collector to become a philatelist (someone who does research on stamps) but the youth of today does need to have a hobby. This will not only provide a means to spend their leisure but can also be a key factor in keeping them away from mischief. A few years ago, renowned auction house Spink hammered a cover addressed to Dacca from Calcutta dated 1776, for an astounding price of 32,000 pounds sterling. Prices realised for Bangladeshi materials at recent postal auctions and online auction houses like ebay.com shows a steady rise. Local auctions too show a similar indication. “What I enjoy most is possibly the stamp auctions. It's a fascinating aspect of the philatelic circle, and possibly unique. I am not aware of any forms of auction held by numismatists or ever art aficionados. Not only does this ensure a 'get-together' of a sort on a monthly basis but also allows a steady flow of materials within the community. And yes the thrill of adrenaline is also there. The thought of someone else buying the one thing missing in my collection, hurts my pride!” said Habib enthusiastically. The history of Bangladesh Postal History can be officially traced back to the eighteenth century. After liberation the collectors have poured in their time and money in a more organised fashion. The call for new blood has been the call of time. But achievements of veterans like Syed Ahsan Habib can not be ignored. They are preserving materials with enthusiasm and passion, which in the course of time will give equal pleasure to someone new to the field.